Urban Adonia: Juxtaposing CicLAvia and Disneyland: Engineering Place or Living It? On Sunday, April 15, I biked in CicLAvia. On Tuesday, April 17, I went to Disneyland. Let's compare. 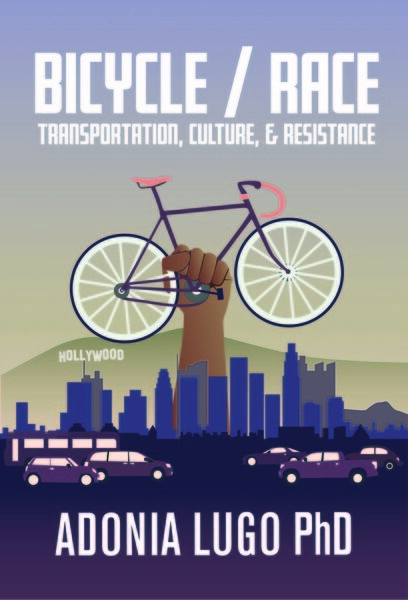 CicLAvia is free to participants. The experiences you have of the day come from the people surrounding you and the interactions you have with the urban environment. Disneyland costs at least $80 for a one day pass. The other people in the park become a nuisance, something to be avoided by using fastpasses and smartphone apps that tell you the best moment to get in a given ride's line. Disneyland attracts crowds of people who don't necessarily like being in crowds. At CicLAvia, people take pictures of crowds. There's a lot of car culture at Disneyland. But there are more cops at CicLAvia. One of the "lands," Toontown, brings to fiberglass life the setting of the 1990 movie Who Framed Roger Rabbit?, a film that comes up surprisingly often when I tell people about my research. Ah, they sigh, the beloved Red Cars used to run all over, General Motors bought up all the tracks in the 50s and made people buy cars, what a shame. This is the conflict the movie dramatizes, like how Chinatown sort of tells the story of William Mulholland. In reality, people in LA started buying cars and rejecting streetcars in the 1920s, voting against purchasing the failing streetcar lines because they saw the privately-owned systems as corrupt and greedy. I wonder how much crossover there is between people who choose to visit Disneyland and people who choose to participate in CicLAvia. In my research on urban space, I've come across a number of critiques of Disneyland as a dangerous vision of a homogenized society. In the 2004 book Popular Culture in the Age of White Flight, Eric Avila argues that Walt Disney’s choice to site Disneyland in Orange County “suggests the affinity between the park and its suburban setting. In Reagan Country, Disney found a physical and cultural environment that accommodated his determination to reassert more traditional notions of an American Way that conformed to popular idealizations of suburban respectability in the age of white flight.” This could be what Disney had in mind, but I don't think that the imagineers have the power to actually brainwash people upon entrance. The park certainly is a nostalgic and hypercontrolled simulacrum of small town America (you must enter through "Main Street U.S.A."), but it also attracts a hugely diverse crowd of people who know that they are paying to be entertained. Disneyland is a great example of "enchantment engineering," the idea that designers can create controlled simulations of experiences and then sell them to consumers. This idea has been picked up by urban planners. In a 2008 essay, Yves Winkin and Sonia Lavadinho described the imagined response of city inhabitants to urban planners' efforts to engineer enchantment this way: "Sure, I know it is still my good old dreary street, but I will act as if it had dramatically changed for the better." Improving neighborhoods becomes a wink-wink-nudge-nudge agreement between planners and users, as though the latter have no role in placemaking and are merely an audience. I don't know about you, but I'd rather build my street through my daily practices than buy into a vision of urban design as collusion in fantasy. In fact, I find this conceptualization of public space as something to be packaged and consumed a lot more frightening than a day at Disneyland.